Welcome to Peru! Our private driver will be waiting this evening at the Lima International Airport to greet you and whisk you off to our hotel in Mira Flores, a beautiful old section of the City of Lima. Day 2 ~ Lima, The Journey Begins! hour flight over the Andes to Cusco. Located high in the mountains of Central Peru, Cusco serves as the gateway to the Sacred Valley beyond. This beautiful, ancient city will inspire you to feel light hearted, even as the altitude (10,700 ft above sea level) leaves you a bit light headed! To help you acclimate more quickly, we check into our hotel in the San Blas section of Cusco, share cups of coca tea, and then rest for a few hours before venturing out for a slow stroll thru the charming, cobble-stoned streets surrounding our hotel. Supper will be light fare at one of the neighborhood bistros. After an early breakfast in the hotel, we board our bus for the short climb to Sacsayhuaman Sacred Site, arriving just as the site opens. This immense ancient place extends over much of the mountainside above Cusco, and remains revered by the Inca as a Gateway to the Stars. Stored within its stones are the keys to the ancient Incan esoteric knowledge of sacred astronomy, as well as the keys to our spiritual history, stored in the Akashic Records. Before beginning our exploration of the site, we ask its permission to enter and then make a personal connection to its energies thru a brief moment of silent meditation. This is a good time to offer prayers of gratitude, request guidance from the spirits, and set personal intentions for your journey. Following a full morning of meditation and exploration of the site, we travel slightly higher up the mountain to explore a little of the more ancient, Pre-Incan ceremonial sites nearby, and then walk back to our hotel in Cusco. 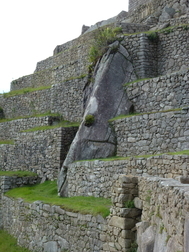 The remainder of the day is yours to experience Cusco. Late morning, we reconnect with our driver and we are off to Ollantaytambo. The drive through high plateaus and mountain roads, draws us back in time as a way of life marked by seasons, not seconds, unfolds before us. We slow for herders moving their flocks and pass farmers tilling fields by hand, as their ancestors did for centuries before them. 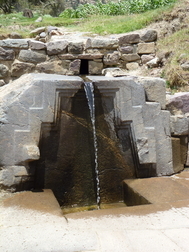 Midway, we stop at the serene pre-Incan ceremonial site of Quilarumiyoc, at the foot of the Apu Soqomarka. The site is small, rarely visited, and powerful. Quilarumiyoc, whose name means “Stone of the Moon” in the native Quechuan language, remains shrouded in mystery, large parts of it as yet unearthed. 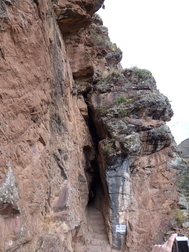 At the mouth of the Mother Cave, the mummified remains of the upper half of a body (determined by testing to be of other than human origin.) are just visible. Crudely drawn petroglyphs cover the walls of 2 caves. Yet etched into the face of a boulder placed near the entrance to the Mother Cave is a finely carved half moon large enough to sit in, and at the lower end of the site lie the remnants of an ancient temple with a small stream quietly running through it. The silence of this place and the peace filled, high, ancient feminine energies present here wrap around us. 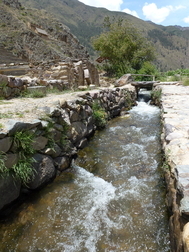 When our time here is complete, we continue on to Ollantaytambo, the rural village where we will spend the night. Today we are off to Machu Picchu! After a very early breakfast, we store our suitcases at the hotel and then walk to the nearby train station to board our train for Aguas Calientes. The trip passes quickly as the train zips by mile after mile of majestic mountain views and extraordinary scenery. Upon arrival in Aguas Calientes, we hike from the train station to our hotel, drop off any overnight supplies, have a mid morning snack in town and then quay up for take the bus trip up Machu Picchu Mountain to the magnificent 7th Wonder of the World! We hike up to the Sun Gate, have an introductory tour of a portion of the main site, hear some of the site’s ancient history, and stop for meditations along the way at places where the energies call to us. At closing time, we return by bus to Aguas Calientes and share an excellent gourmet dinner at a charming café tucked into one of the back streets of town. We rise early for breakfast and then catch the bus back to Machu Picchu to begin our exploration of some of the less visited areas of the site. 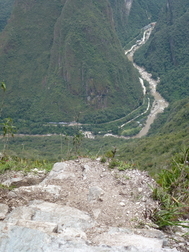 Join us for a hike to the Inca Bridge or for the more challenging hike to the top of Machu Picchu Mountain! As we trek upward along paths created centuries ago, we offer up to the spirits of the land, the mountain and the Universe all that we have yet to release. Upon our descent to the main level of the site, we share in some teachings and visit the Sacred Wacas, the Temple of the Condor, and many other magical temples. In the afternoon, we return by bus to Aguas Calientes in time to share another great meal before our train back to Ollantaytambo. The bus arrives very early this morning for our return trip to Cusco. Our first stop, near Urubamba, is at a well known local potter’s home and studio, for his fascinating demonstration of how his works are created. Our second stop is Chinchero, a small Andean Indian village located high up on the windswept plains of Anta. Chinchero is believed by Peruvians to be the mythical birthplace of the rainbow. Traditional dress, still worn by most locals, reflects the vibrant colors of the rainbow and the local landscape. 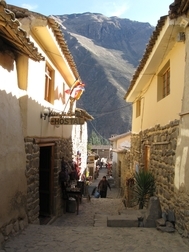 The village overlooks the Sacred Valley of the Incas and offers beautiful views of Cordillera Vilcabamba and the awe-inspiring, snow-capped peak of Mount Salkantay. Here, we tour a local weaver’s collective to learn how wool is spun, dyed and woven, and stop to see the village’s most striking remnant of early Incan times, a massive stone wall in the main plaza which has ten trapezoidal niches. 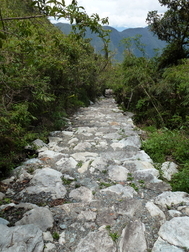 There are also many other ruins, including sacred altars and agricultural terraces to explore. After a leisurely breakfast, take time to return to some favorite haunts, find that last special treasure, visit the Central Square, or do one final walking tour of our San Blas neighborhood. Rejoin us at our hotel mid-afternoon. Our driver will be waiting to take us to the airport for our afternoon flight back to Lima. The morning is yours to visit one of the nearby museums, make your way to one of the pretty nearby parks, do some last-minute shopping, or perhaps have late morning tea at one of the many charming local cafes. 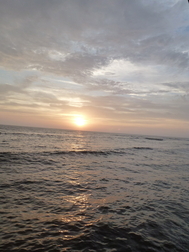 After a noon checkout at our hotel, we’ll store our luggage, taxi to the beach for an early afternoon stroll, linger along the levee for a final meditation or bit of day dreaming, and then share a wonderful early farewell dinner at a spectacular restaurant on the pier. After dinner, we return to the hotel, gather our luggage and transport to the airport to catch evening flights home.